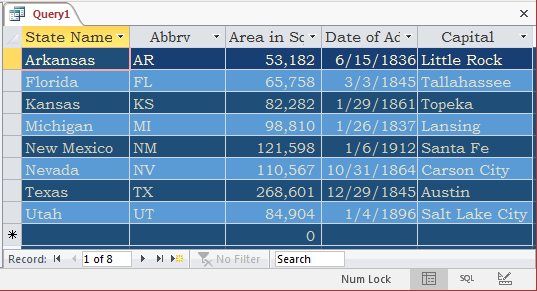 If you have a set of records falling in a range of numeric, alphabetic, or chronological values, you can specify an interval within which the records should be selected. 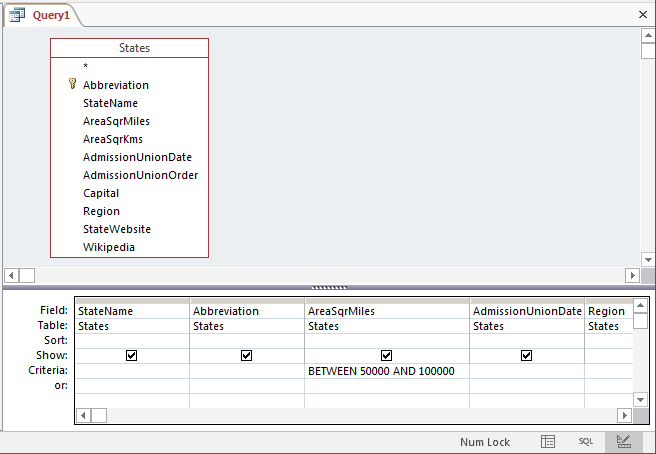 To support this operation, the SQL provides the BETWEEN and the AND operators. 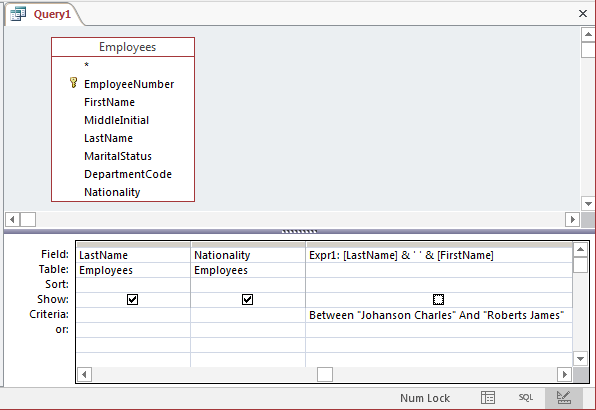 The BETWEEN and the AND operators are combined to get a list of records between this and that values. 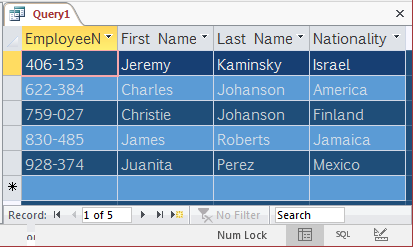 Click the Criteria box for the StateName column and type: BETWEEN "i" AND "n"
In a BETWEEN ... AND expression, the items on both sides of the AND operator must be constant values, at least at the time the statement is run. The values can come from expressions. 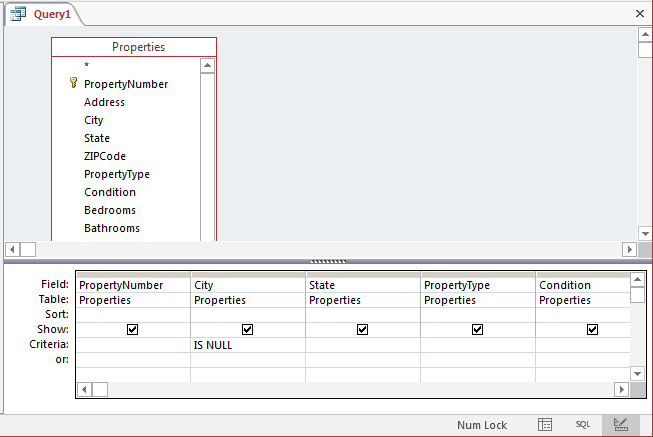 Since the AND values must be constants, if you want to use an expression, you can create it in the SELECT statement and use the resulting values in the AND operation. 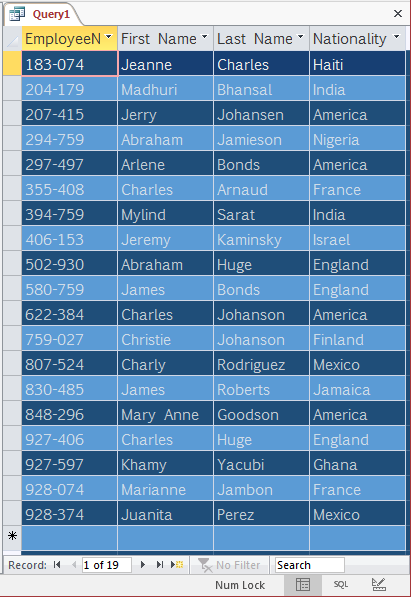 Click the Criteria box below it and type: Between "Johanson Charles" And "Roberts James"
The values of a BETWEEN ... AND expression can come from a function. 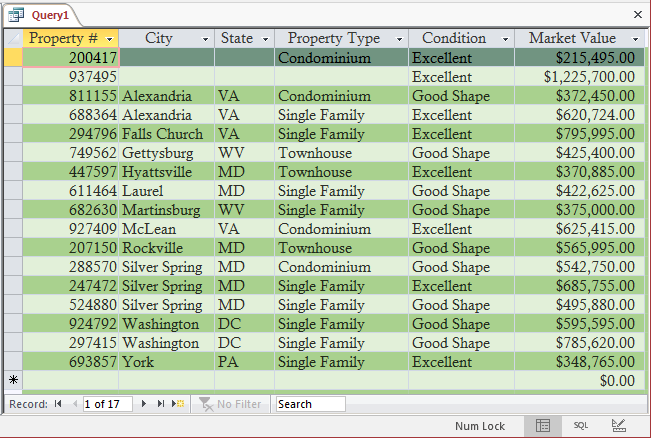 As mentioned for expressions, the important rule is that Microsoft Access must be able to evaluate the values on both sides of the AND operator as constants when the results are requested. The IN operator is followed by parentheses. Inside the parentheses, type each of the desired values from the column on which to apply the filter, separated by commas. 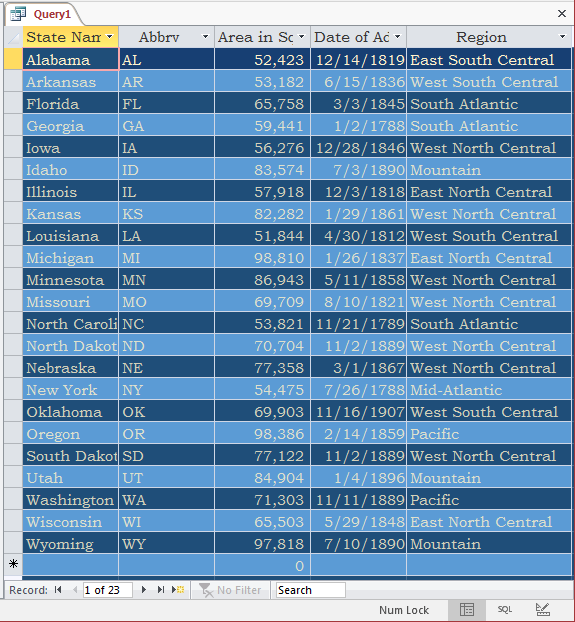 To create an IN operation on a table, a query, a form, or a report, use the same steps we reviewed for the BETWEEN ... AND expression. 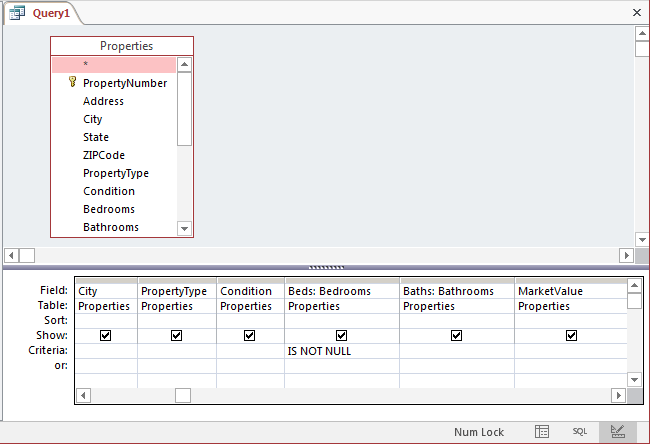 In the Show Table dialog box, make sure Properties is selected. 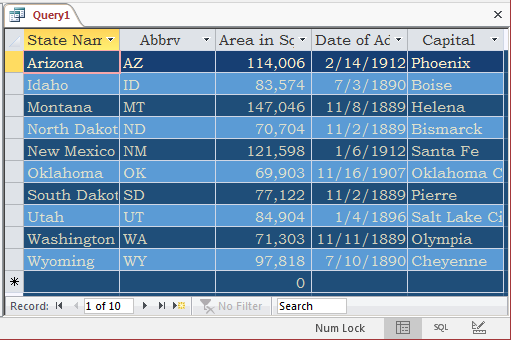 When filtering records on a range or a group of records, you can sort them. 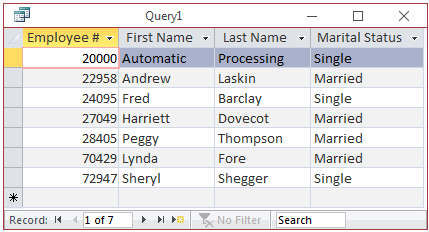 If you are using the Query window, use the Sort box of the text box of the column of your choice. 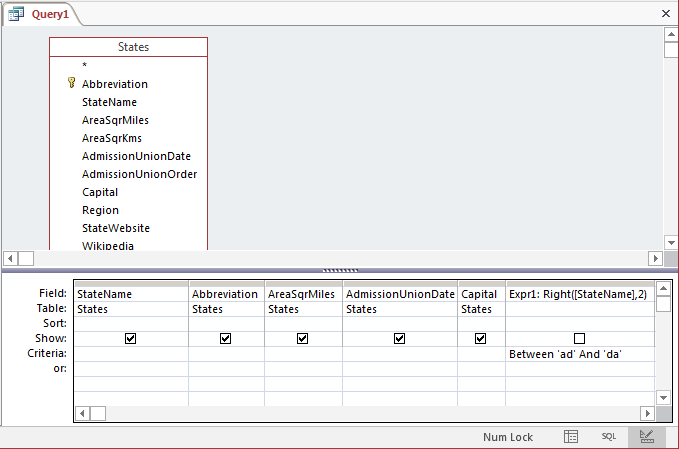 In SQL, remember that the ORDER BY clause is the last section of the SELECT statement. 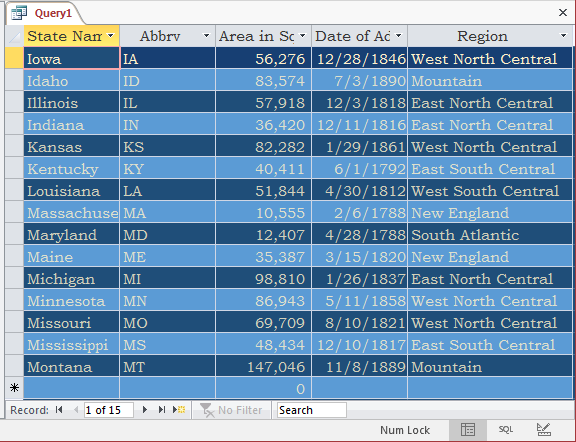 In this case, only the records that are null or empty in the field-name will be considered in the result. 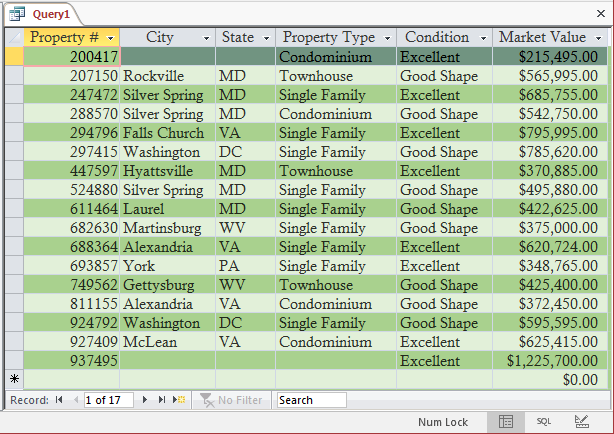 As mentioned in Lesson 22, Microsoft Access provides many functions that can be used in conditional statements. 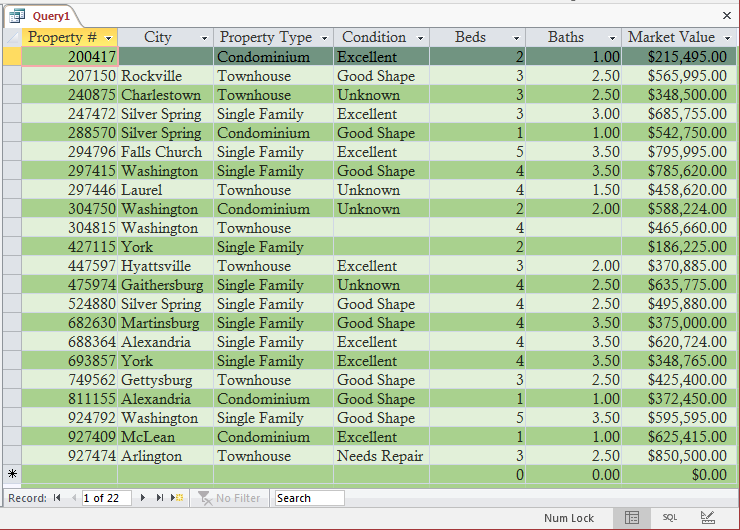 Besides the functions we have used so far (IIf, date-based, etc), some functions can be valuable when performing data analysis. The first argument of this function is the condition that should be tested. It should provide a natural number. After this test, the condition may evaluate to 1, 2, 3, or more options. Each outcome is then dealt with. The first outcome will be used if the firt condition produces 1. The second outcome will be used if the condition produces 2, and so on. Unlike IIf(), the Switch() function doesn't take a fixed number of arguments. It takes as many combinations of <Expression -> Statement>s as you need. Each expression is evaluated. If the expression evaluates to true, the statement that follows it executes.